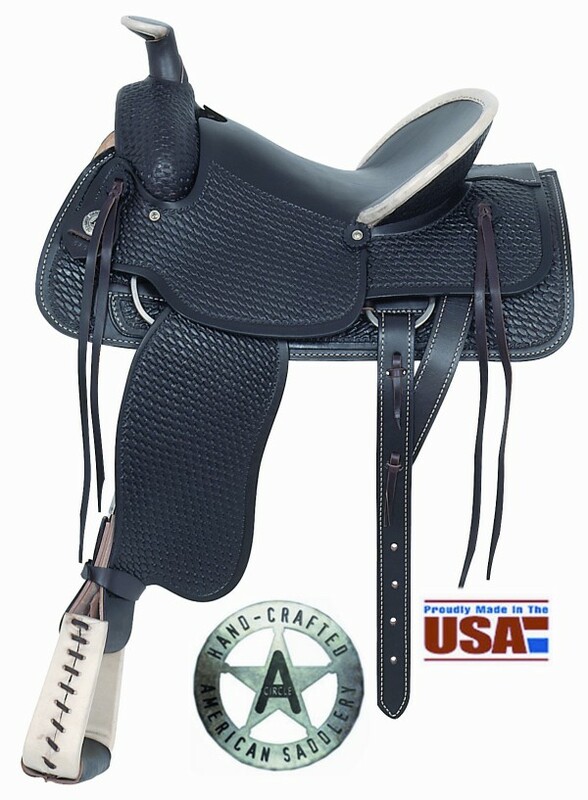 Circle A by American Saddlery 16" Basket Weave Stockman Ranch Saddle. The Tipton Stockman Saddle styled with a slick seat and rawhide edged cowboy cantle to give it that great, old-timey look. Available in Rich chestnut or Medium Oil. TREE: Double fiberglass-covered. Quarter Horse Bars. HORN: Height 3 1/2", Diameter 3", Leather-covered, Rawhide tipped. CANTLE: Height 4 1/2 inch. SKIRT: Length 28 inch, Width 13 inch. STIRRUP LEATHERS: 3 inch with Blevins buckles. STIRRUPS: Hand-Laced natural rawhide covered deep ropers. RIGGING: Double stainless steel dees in 7/8 position.